This morning I saw that there was a new Weekly Photo Challenge: Sea. I have no photographs in my archive of the sea, even though I live quite near to the coast. I thought about passing on this challenge… or taking a trip to the coast, but it’s Saturday and a beautiful one, with Sun, blue skies, warm weather… so the roads will be busy and it is too far to walk or cycle… for lazy old me anyway. Then a bolt of insane levels of inspiration frazzled my mind… and almost blew up my computer! I have always loved the ocean. I learned to swim as a baby when I was thrown into a pool… because we had a pool and my parents thought I’d better learn to swim just in case I fell in and no one was around to care if I lived or died. Or something like that. When I was about a year old I was put into a baby floatation device in the sea, and promptly forgotten about. A concerned stranger alerted my parents to the fact that I was steadfastly paddling my way out towards the horizon. Or something like that. One Summer my parents were invited on an old fisherman’s boat which had been converted into a passenger ship of sorts for a cruise of the Greek islands. We stopped here and there and sometimes nowhere. The crew almost fainted… and they were a very hardy bunch, salts of the sea, the fishing boat was theirs, but the days of making a living by fishing alone had passed so they did cruises too… when my five year old self threw herself overboard into the deep, dark, cool water, then started swimming, and diving under the boat. They had never seen a fish in human form before. Or something like that. I dream of the ocean all the time. Sometimes there are sharks lurking. I find sharks fascinating. Sometimes there are aliens… but that is another dream. The image above is a photo montage, using a sketch I made and photographs in my archive, the water was created using a macro shot of ice crystals. And although I had this particular dream many years ago, it remains embedded in my psyche… because it was rapturously beautiful. In the dream I was a Japanese lady, who lived in a house by the sea. 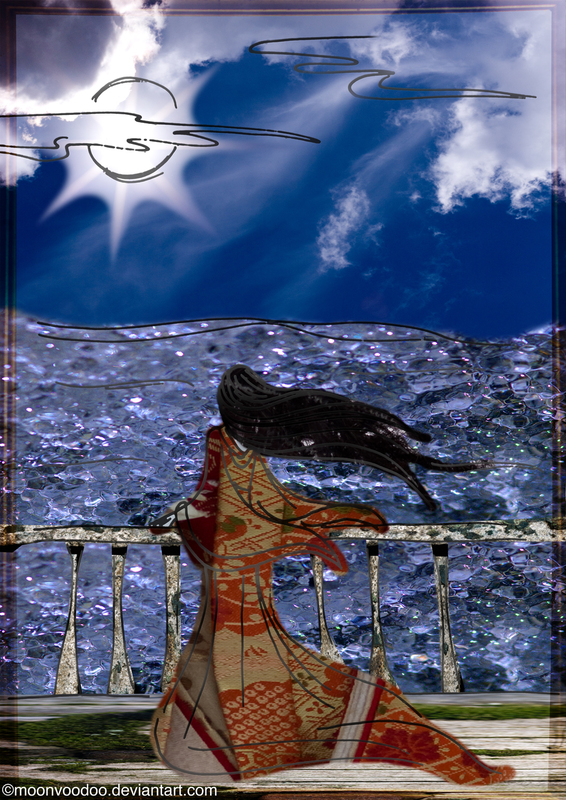 She was contemplating her life, and her feelings were so strong they drew her out on the deck adjoining the house which stretched far over the waters of the sea. As she walked towards the balustrade at end of the deck, she removed the comb which held her hair tidily in a bun and let the wind blow it loose and free. The dream was very sensory. I loved how you repeated “or something like that”. Loved the pele-mèle of emotions in here. A very sweet and sour blend of oppositions which makes it truly a masterpiece. Do you always write this way? I need to explore more of you. Thank you very much 😀 Wow! What a wonderful compliment! I write the way I think, and I talk to myself a lot in my mind. The “or something like that” is a stock answer which I use to silence a voice in my head which likes to question my memories, ideas and views. It prefers precision but it will settle for admittance of imprecision. Pingback: Weekly Photo Challenge: Sea (Walks) | What's (in) the picture?